Listed is an informational flyer for the Carolinas Healthcare Systems, whose employees receive supplemental benefits from National Benefits Programs. Here is a transcript of the information flyer for all Carolinas Healthcare Systems employees. Now share the same supplemental benefits programs currently in effect with all federal, state, county municipality and city personnel, including police and fire rescue, civil service, school system, hospital and military personnel. 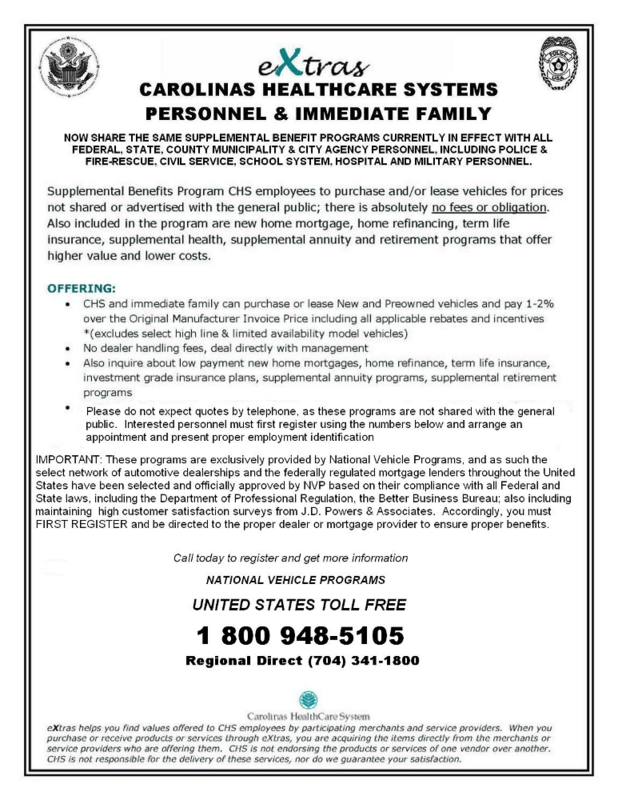 Supplemental benefits programs CHS employees to purchase and/or lease vehicles with prices not shared with the general public; there is absolutely no fees or obligations. Also included in the program are new home purchase, home re-financing, term life insurance, supplemental health, supplemental annuity and retirement programs that offer higher value and lower costs. IMPORTANT: The programs are exclusively provided by National Benefits Programs, and as such the select network of automotive dealerships and the federally regulated mortgage lenders throughout the United States have been selected and officially approved by NBP based on their compliance with all federal and state laws, including the department of Professional Regulation, the Better Business Bureau; also including maintaining high customer satisfaction surveys from JD Powers and Associates. Accordingly, you must first register and be directed to the proper dealer or mortgage provider to ensure proper benefits.